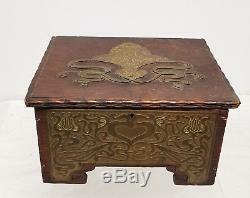 Antique vintage Art nouveau style arts and crafts box with a broken lock. Some items we offer have age and wear, this wear due to age may include breaks, repairs, repainting, or restoration, we try to call this damage as well as possible but please refer to the photography for a full description. HEIGHT 5 inches 12.5 cm. WIDTH 7 inches 18.0 cm. If you do need information I have neglected to include, make an offer, or additional photos, please don't hesitate to ask, I will do my best to comply. The item "Antique Vintage Art Nouveau Bronze Oak Casket Jewelry Box Arts and Crafts" is in sale since Wednesday, May 23, 2018. This item is in the category "Antiques\Periods & Styles\Art Nouveau". The seller is "theoldcanaanmarket" and is located in Canaan, Connecticut. This item can be shipped worldwide.